When it comes to staying hydrated, it is very important that you have the means to carry fresh drinking water with you when you’re out hiking or camping. But everyone knows that it’s a hassle to lug around a million and one plastic bottles. Don’t you wish there’s a hydration tool that is less bulky and easier to carry around? Well, the answer to your dilemma is the best collapsible water bottle. 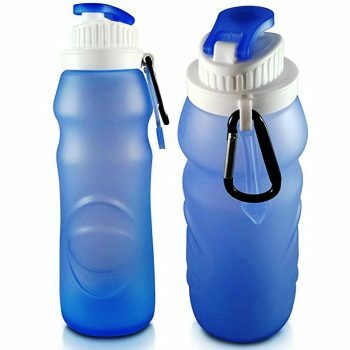 Collapsible water bottles use highly durable and flexible plastic which allows them to expand and contract. This collapsible design allows them to take super compact form factor and offers more space savings which is great for outdoor activities and exercises. With the number of products out there, it can be rather daunting to shop for a collapsible bottle. Don’t worry because we are here to help! In this article, we’ll provide you with a list of the most important features you should be looking for, as well as a number of the top rated products in the market for you to consider. By the end of this article, you should be well on your way to finding a collapsible water bottle that’s perfect for you. Before we discuss the different products and what makes them such excellent choices, it’s very important that we first discuss the features you should be keeping an eye for. You may find a few bottles that only meet some of the criteria listed here, but some is better than none, and you don’t want to be stuck out in the woods with a non-functioning water bottle. A good quality collapsible bottle should be reusable and washable. That’s why they usually have a higher price, and this is almost always the case, although it should be specifically stated by the manufacturer. Lighter bottles, which can be a lot cheaper, are made from thinner plastic and are not reusable. These bottles are not recommended since even a small amount of heat, like from direct sun light, could release toxic plastic chemicals into your water. For this reason, the thickness and the type of the plastic matter. So consider spending just a little bit more for a quality bottle that won’t make your water taste funny. Why not do your part for the environment by considering the source of plastic for your collapsible water bottle? Although your bottle is durable enough to last for years to come before it will need replacing, there’s no reason you can’t consider one that’s made from recyclable plastic. That means that the bottle itself can be recycled when the time comes, so you’re putting it back into the cycle of creating future products and tools without harming the environment. This one’s an obvious choice, especially if you’re quite eco-conscious. The dimensions are an important feature to consider, and we’re talking about more than just how small the bottle can collapse. How much water it can carry is also essential, as you need to ensure that you’re carrying enough drinking water with you for the trip. Calculate the length of the trip you are planning on taking and the available water sources around; you may be able to refill, but be sure to also bring the means of making your water potable. Comparing this with the recommended daily amount of 2 liters will help you to determine how much water should your bottle be able to carry. There are some materials out there which are spicing up the water you put inside them. The problem is that the spice is plastic. For this reason, make sure its materials are BPA-free, as bottles containing BPA tend to leech a plastic flavor into the water. All of our reviewed and tested bottles are BPA-free, at least for a certain amount of time. After a few years of use, every plastic starts to deteriorate, resulting in that underlying flavor in your water. The weight of the bottle is also important. In fact, the whole point of buying a collapsible bottle lies in its space and weight. All collapsible bottles are designed to be lightweight. However, the harder the plastic, the higher the weight. And the harder the plastic, the safer your drinking water will be. The lightness of the bottle and the kind of plastic material used are features you need to find a balance for. If you are planning to use it for the recommended time period of one year, you could choose the lightest one on the market. However, if you are planning on replacing it after couple of years, than you should focus on the bottle’s material instead of its weight properties. There are also some bottles that can be kept clean in the dishwasher, and some that can’t. This is a relatively important feature, for the simple reason that only a dishwasher is able to thoroughly wash the bottle, eliminating any potentials for bacteria or mold growth. If you have been unknowingly putting contaminated water inside, the only way to destroy the bacteria is by washing in higher temperatures in a dishwasher. That’s why it’s important to consider the kind of plastic bottle you want to get. Thinner, lighter bottles tend to be flimsier and can’t handle the high temperatures of a dishwasher, while the sturdier ones, although heavier, can handle the high water jets and vigorous cleaning. Now that we’ve discussed the essentials, it’s time to take a look at some of the best collapsible water bottles the market has to offer. Maybe some of these are perfect for your needs, while other readers may discover that they’re looking for something else, and that’s okay. This list is only meant to help you find what you’re looking for, instead of stumbling around in the dark for a good quality product. Now that that’s said and done, let’s take a look at some of these great products. This GFree 750 ml Collapsible Water Bottle is designed for any outdoor activity. It is made of medical-grade silicone, is non-toxic, as well as FDA-approved and BPA-free. It is made from the same material used for creating trendy baby products, and you can use it for hot or ice cold drinks. It is good for outdoors, exercise, yoga, work or school. The product has a check valve designed for preventing water leaking out even when held upside down. This product is great because of its lock ring that prevents the bottle from accidentally opening. This product is available in many variants: blue, orange, pink and gray. 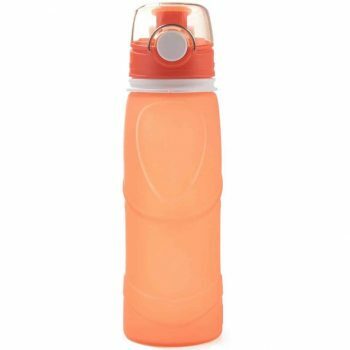 The bottle has a wide-mouthed design that allows you to clean up the interior and it helps add water or ice easily. The product is easy to wash and easy to maintain. Overall, this is a solid water bottle with a great price. Related: When it comes to taking some fresh hot breakfast with you while you’re hiking, you need some way of keeping it warm for when you get there. The Energify Insulated Stainless Steel Food Jar promises to do that for you, and so much more. It’s made of food-grade stainless steel and is completely BPA-free, ensuring that no harmful chemicals are leeching into your food. And when you’re ready to eat, the lid serves as a deep bowl for you to pour your hot oatmeal, chili, or soup into and enjoy until it’s all gone. These Baiji Bottle Collapsible Silicone Water Bottles are an excellent choice for your adventure trip. It is made of food grade silicone and it is stain, odor, and taste resistant, so your water tastes crystal clear every time. The bottle is rollable and foldable, so it can fit just about anywhere, even in one of your pants pockets. It also has a metal carabineer and retainer band to clip to the outside of your backpack for easy storage and use. The set consists of two bottles, which an extremely affordable find, and comes in two different colors so that you and your hiking partner won’t get your bottles confused. What makes this set even more spectacular is that they’re dishwasher safe, so there’s no reason to worry about germs or bacteria festering inside your bottle the next time you need to take it out on the road. Related: Need an extra backpack but don’t have the space for it in your trunk? The Zomake Ulta Packable Backpack could be exactly what you’re looking for; this 20-litre backpack folds down into itself until it’s small enough to fit inside your pocket. Just take it out when you need it to carry more gear, and you’re ready to go. It’s available in a wide range of colors, so you might have a hard time picking out just one. The Mylivell Collapsible Silicone Water Canteens are made of soft food grade silicone with FDA approval, and is also BPA-free, and can even be used in temperatures of 40˚C to 100˚C degrees. The bottles are unbreakable and foldable, making them a perfect fit for any outdoor action. The bottles are available in many different colors which is perfect for family and group activities. There are two sizes of this set. The small set is for kids and the large is for adults. These water bottles are lightweight and come with clips that make them easy to carry. This product is great for traveling, climbing, camping or hiking. One of the specific characteristic is that the bottles have a wide open mouth which is easy to drink and refill. They are durable for many years of use and they are also easy to clean. Whether for traveling or outdoor activities, this is a solid collapsible bottle. Related: For the minimalist packer, every pocket counts if you want to maximize on the gear you bring with you. Here’s the Kanga Pocket Blanket, which fits in a pouch the size of your fist. The drawstring enclosure keeps everything inside, and the carabiner clip allows you to attach it to the outside of your backpack for easy storage and allowing for more space for gear in your bag. The water-resistant finish of the blanket means it can also be used on the ground to prevent the seat of your pants from getting wet. 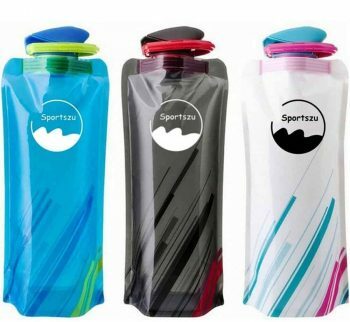 The Sportszu Collapsible Water Bottles is made of food-grade material, is BPA-free and it won’t harm your health or the environment. The items have a fun design and they are extremely easy to carry, especially with its unique design. It comes in three attractive colors and designs that will help you and your hiking buddies tell them apart. The large mouth also makes it easy for you to slip ice cubes inside, allowing you to keep your water cold for a lot longer. And while the ice melts during your trip, you’ll just have more water to drink, so there’s less need to refill. Washing these bottles is a breeze too. Just add some dish soap and hot water, put the cap back on, and give it a good shake. Rinse thoroughly, and then allow to air dry. Your bottle will be ready to go again in no time. Related: Hypothermia can be your biggest enemy when you’re out on the trail, and the fastest way to succumb to it is when you get wet. The IRI Rain Poncho will keep you dry, however, and stores away easily into any backpack. The drawstring on the hood help you keep it in place so there’s no leakage into your poncho, getting your clothes wet. This purchase also comes with 4 ponchos altogether, so you can save them for a rainy day, or have one for each of your family members on your camping trip. The Geusa Collapsible Travel Water Bottle is a perfect choice for any friendly action, with 550 ml capacity and made of BPA-free, food-grade silicone. A lightweight bottle which is durable and easy to carry. It’s a perfect fit to your camping gear or for your hiking and hunting trip. It is also good for camping, sporting, skiing and running. This product is a perfect fit for your car or bike. It has a metal carabineer and silicone retainer to attach to your traveling equipment. It is good for children because it won’t be broken when dropped. It is toxin free, lead-free and PVC free. It can be used in any situations and it is dishwasher safe, so it will keep its shape near 200˚C. However, one of the most noteworthy features of this bottle is definitely the price. Lightweight, solid features and great price, what more can you ask for? Related: When you want to keep feeling clean during your trip, you want some way to carry some body wash and shampoo with you, but lugging around those huge bottles can take up a lot of space. Instead, consider the Nalgene Travel Kit to take care of all your problems. It comes with a two 1 oz. jars, two 2 oz. jars, two 4 oz. jars. They’re all BPA-free, and are easy carrying solutions for all your shampoos and lotions. 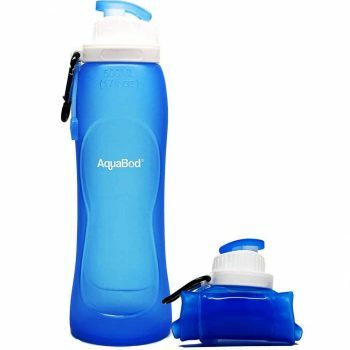 The Aquabod Collapsible Water Bottle is made from non-toxic FDA approved, is BPA-free and made of medical-grade silicone. If you go on hiking, camping, biking, running, traveling or just sporting activities, this bottle is a good fit to your equipment. It is easy to clean and dishwasher safe so that the bottles don’t have any smelly odor or funny taste. They have a hygienic cover for easy one-hand operation, which can be crucial during any hike or climb. These bottles are also extremely versatile so that they can be used in just about any activity, from biking to jogging to working out at the gym. However, it’s important that before use that you wash these bottles with warm soapy water. The bottles are available in 4 colors: black, blue, pink and white. Looking at the price, this is one of the pricier models on this list. However, the great design, features and construction certainly make up for the slightly higher price. Related: Wanted to keep your clothes clean on the go? Consider the Lewis N. Clark Woolite Travel Laundry Kit. It comes with a sink stopper and eight packs of liquid soap to use on your dirty laundry. Not everyone wants to shell out quarters to use for the laundry machines at hotels. Instead, you can wash your clothing right in your sink, rinse them out, and hang them up to dry. It’s as simple as that. The Mansov Silicone Collapsible Water Bottle is made from medical-grade silicone, food grade PP+PC+BPA free and it is FDA-approved. That means that you can rest assured that this product was made with your safety in mind. The product is unbreakable, reusable and durable enough to withstand any punishment you can deal on it, whether it’s hiking or biking. Because of this, it’s a great choice for your children; they can’t drop and break it, and they’d have a hard time tearing these open with their hands. It can also withstand temperatures of – 40˚C to 100˚C. That means that this will bottle will continue working for you, even during the winter months, as long as you have the means to keep your water from freezing. But you’ll never have to worry about it leaking at all; the seams are airtight, and as long as the cap is locked in place, you won’t have any water spilling out. Related: Having potable water with you is important, but sometimes you want a warming cup of tea before turning in for the night. Instead of lugging around a heavy stainless steel kettle, the Dltsli Collapsible Tea Kettle can be packed away easily, and still provide you with a pot of hot water. Available in five attractive colors, this kettle has a stainless steel base that conducts heat well without melting the silicone body, and serves as a steady base for whatever surface you place this kettle on. Hopefully, we have made your choice a bit easier and save you a few hours of research or disappointment from buying the wrong product. It may seem like a simple choice to go to any store, pick out the first bottle you see, and slip it into your cart. However, there is so much more to getting a bottle than picking the one with the nicest color. Do you have a collapsible water bottle? What is your favorite and what different features do you look for? Please do share your comments and stories with us in the section below. We’d love to hear from you. Kayak vs Canoe: Which Watercraft is Right for You?